We're all aware of the world's sudden realization that coloring is good, cheap therapy... finally figuring out what we've known all along! I love the recent adult coloring book surge. 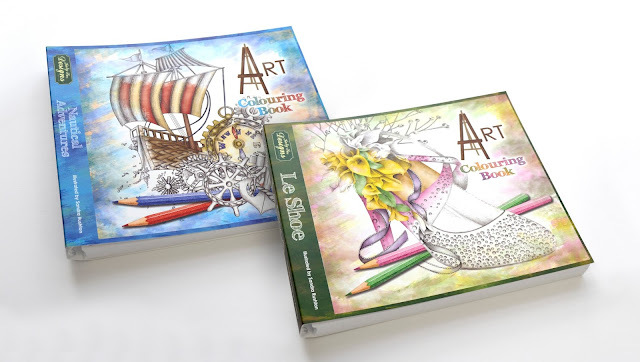 I was honored to receive two brand new editions of the Art Colouring Book series from Katy Sue Designs to play with and review - these are beautiful volumes featuring original artwork by Sandra Rushton. Being released at the CHA MegaShow today are Nautical Adventures and Le Shoe! I'm looking forward to seeing the Katy Sue Designs crew in person this weekend. A little about the books themselves - you can see the size and thickness of the books here... The pages are beautiful heavy weight cardstock that can be removed from the spiral and trimmed to 8" by 8".Each book contains 70 coloring pages, some shaded artwork, some line art, and some patterns with similar themes... there are 10 themed mini collections in each book. 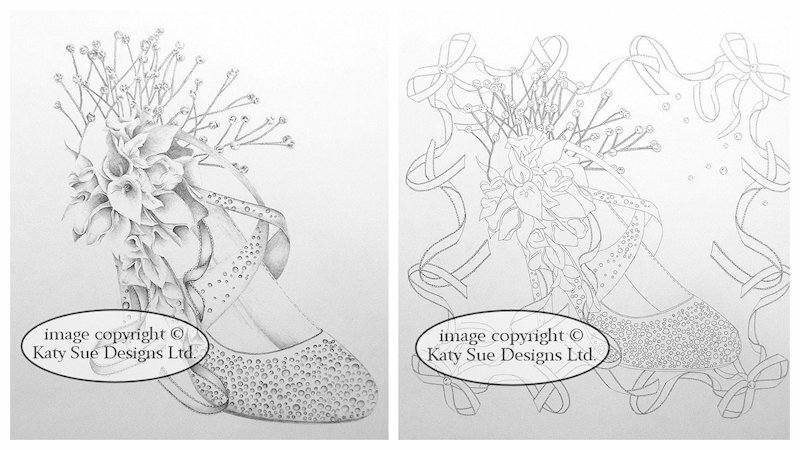 You can see the difference between the shaded artwork and the line art below. The designs, which are printed on just one side of each page, could be used for scrapbook or smashbook pages, cut out and framed, or incorporated into other cards or crafts. I love the way the spiral binding lays flat for easy coloring. The nautical book has a strong Asian theme, which was a lot of fun for me as well. Of course I had to test a few different mediums out! I started with Prismacolor Pencils - my hand cramps so easily these days, so with all these little details, I really appreciated the softness of these old favorites. The Prismacolors were my favorite medium to use of all that I tried, and it was so much fun to really get into the small areas to bring out the intricacies of each section. I used a Caran D'Ache Full Blender to smooth the color in some areas, and that worked very well. Mineral spirits can also be used with good results, and no bleed through. The next medium I tried was watercolor, and I used Peerless sheets for this piece. I didn't take the time to really go into the details but I may do that with watercolor pencils or some markers at a later time... I really was more interested in seeing how durable the paper would be with water. The paper held up surprisingly well to the water, with no bleeding of the ink. Warping was pretty minimal, and flattened with the weight of other pages after it dried. For this shoe, I used a variety of watercolor markers (Zig Clean Color, Akashiya Sai and Distress), and was a little less impressed... I'm used to using these markers on watercolor paper where the color stays on top of the paper and blends well with water or with another marker applied over the top. I was able to do some tip-to-tip blending with the markers, and also was able layer the colors for a blended look, just not necessarily the look I was going for! :) Here I used a white Posca pen to add some highlights - that worked well. I don't normally color like this with these markers and I probably wouldn't again, but... that is why we do test pages! If you normally color with water-based markers hopefully this info helps. Distress markers behaved the best for me. For a final test, I used alcohol markers, and was pleased generally with how that went, except for some bleeding in the areas that I overblended... again... I'm used to blending a little more heavily on cardstock that holds the ink in place, so I did have a few issues in some areas that were more my fault than the fault of the paper. :) There's more evidence of the paper working than there are areas that bled. The googlie eye just needed to happen there. Here is the back of the page so you can see that there is significant bleed-through. A piece of cardstock or a teflon sheet between the pages keeps the ink contained to the back of the page, and not affecting the pages under it. Not a problem! AWESOME!! !Love your work! !Thanks for sharing!!! You worked wonders with these pages. I would have never thought about using other mediums. My daughter, who doesn't have a crafty bone in her body, discovered colouring when she was give a book at Christmas and boy has she gone to town. I texted her some of my cards using Prisma and OMS and asked her if she'd like me to teach her to blend and shade and she said yes. She's so pumped. I'm going to link this post to her e-mail so she can see your beautiful work. WOW!!!! Stunning coloring, Dina! Love that dragon and lanterns. I am working on some project for Chinese new year and this just inspire me :) Thank You so much! Wow these are beautiful! I wish you could come to my house and teach me!!! YOU my friend, are a COLOR MAGICIAN!!!! SO AWESOME!!! Good info....I have 8 coloring books and each seems to have different paper, so just have to play with each to see what medium works best. One additional thing I have done is to take my own choice of paper to a copy place and have the coloring book page(s) reduced and copied using a laser machine....then I can in turn run it thru my MINC - then color....adds a different look and I can use then on cards. Wish there were smaller coloring books so we could use the pages on cards.